I am very late to the party on this one. Daft Punk gained a loyal following after their debut release, Homework (Daft Life/Virgin, 1997) and grew into a techno/house mega-act after 2001’s Discovery (Daft Life, Virgin). But not until their hotly anticipated Random Access Memories (Daft Life/Columbia, 2013) started making waves did I come upon this synth duo from France. Guy-Manuel de Homem-Christo and Thomas Bangalter (a.k.a. Daft Punk) helped shape the French House music scene in the 1990’s and innovated their own brand of synth pop and techno through futuristic synth sounds and the extensive use of the vocoder. The duo uses robot costumes in their performances, which are the finishing touch to Daft Punk as a concept band. Random Access Memories, much like Homework and Discovery, has a range of music that will appeal to different tastes. There are pure synth arrangements like “Contact,” “Motherboard,” and “Giorgio by Moroder,” the latter featuring a monologue from electronic music pioneer Giorgio Moroder, who the band no doubt holds in high regard. Pop features prominently as well. The first single, “Get Lucky,” featuring Pharrell Williams, reached #1 in the UK and has the best hook we’ve heard in a long time from Nile Rodgers, whose funky guitar lines are also prominent on “Give Life Back to Music.” But even Rodgers can’t save some of the more repetitive songs like “Lose Yourself to Dance” and “Doin’ it Right.” These tracks lack the dynamism of Daft Punk’s better work, offering only flat and trudging choruses. More downtempo tracks like “Instant Crush,” “Beyond,” “The Game of Love,” and “Within” range from nice ballads to more experimental outings. “Touch,” featuring 70’s songwriter Paul Williams is one such experiment that has its moments but ultimately leaves the listener wondering how it made the cut in its current form. I don’t normally write about mainstream music so this post has turned out to be somewhat of an accident. When I started tracking Daft Punk some months ago, I didn’t realize how big they were and what a massive pop record this would become. The marketing machine behind it included a viral video campaign with mini documentaries featuring each of the collaborators on the album (this one with Giorgio Moroder is particularly interesting). TV ads were run and I recently found it featured in a Target flyer, of all places. 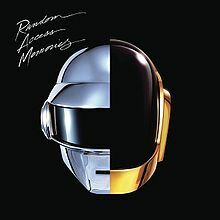 Although Daft Punk is not something I would normally place in my musical wheelhouse, I made some nice discoveries not only on this album but also from their back catalog. I’m glad I ran into them.